UPDATE: This beer fest is SOLD OUT. No tickets will be sold at the door. Many CT brewers under one roof at the 5th Annual Connecticut Brewers Fest! $30.00 gets you a glass and unlimited three oz pours of some of the best beer the Nutmeg State has to offer. Very limited tickets available! A portion of the proceeds from the fest will benefit the Connecticut Craft Brewers Guild! 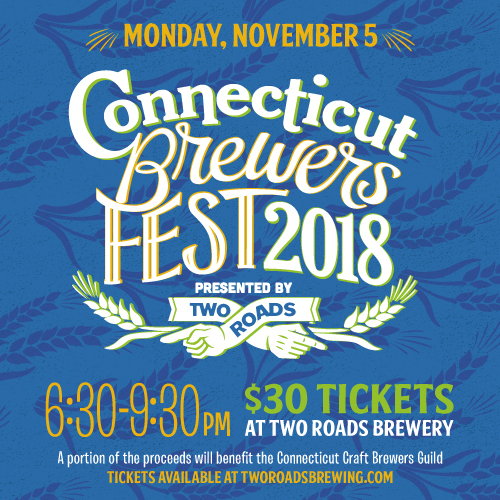 The money raised from the CT Brewer’s Fest on Monday, November 5th will directly benefit the guild’s continued efforts to fuel, protect and promote the craft beer industry in the state! In addition, the money will to help with initial funds needed for the two fundraising events in 2019 and continue to help benefit the CT Brewery Passport Program.